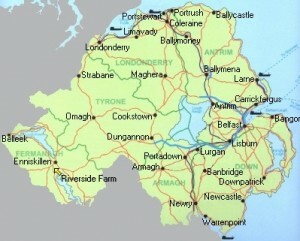 Riverside Farm is situated two miles outside the historical town of Enniskillen in Northern Ireland. From Belfast you take the M1 motorway west through Dungannon to Enniskillen. Take the A4 Sligo road for one mile. Just passed a Maxol filling station on the right hand side and Nissan car sales on the left, you turn left onto the A509 towards Bellanaleck for approximately 1/2 a mile. Look on your left hand side for the sign for ‘Riverside Farm’.